Today, shareholders of Tahoe Resources and Pan American Silver will meet and vote on a new business opportunity – Pan American Silver’s acquisition of Tahoe Resources to become, in their eyes, one of the largest publicly traded silver companies in the world. The vast silver reserves at Tahoe’s flagship Escobal mine in southeastern Guatemalan may seem impressive, but do shareholders with Pan American Silver really know what they are buying? With this acquisition today, Pan American Silver inherits a legacy of conflict, violence and well-documented human rights abuses associated with Tahoe’s operations at Escobal. In 2013, several unarmed protesters on a public road outside the mine were shot at by Tahoe’s private security. One of the people injured, who was 17 at the time, was shot multiple times in the face. This serious assault is currently the grounds of a civil lawsuit against Tahoe Resources in British Columbia courts – one of the first times in history that a Canadian company is facing civil litigation in Canada for violence at its overseas operations. In 2014, 16-year-old Topacio Reynoso Pacheco, an environmental activist and youth leader in the movement against mining, was shot and killed. Her father and fellow environmental defender, Alex Reynoso, was shot and seriously injured. He survived another armed attack in 2015. Just last year, Estuardo Quevedo, another environmental activist in the movement against the Escobal mine was shot and killed. These are only a handful of examples of the violence communities have faced for their opposition to this project. They have also suffered militarization, constant surveillance and the suspension of civil liberties. Dozens of arrest warrants issued on baseless charges have been lodged against community leaders who oppose the project. Impacted communities have never stopped resisting using creative and resilient strategies, like dozens of marches and protests, countless legal actions, and over 15 community and municipal-organized referenda where the vast majority of participants have said “NO” to mining. In June 2017, they took direct action and successfully shut down operations at the mine when they erected a permanent resistance encampment up the road from Escobal. A month later, a Guatemalan court suspended the Escobal license – a decision that has since been upheld by the Constitutional Court, which ruled in September 2018 that the rights of the Xinka People had been violated when they were not consulted prior to the start of the Escobal project. By buying Tahoe, Pan American has also acquired this legacy of disregarding legitimate community concerns and pushing through an unwanted project which resulted in repression, social conflict and suffering. Why has Pan American Silver ignored the demands of impacted communities to shut down the Escobal mine and instead, invested in Tahoe Resources? Why would Pan American Silver want to adopt Tahoe’s legacy of serious and well-documented human rights abuses? And why is Pan American Silver so confident it can get the Escobal project back up and running, despite the fact that strong opposition has succeeded in suspending the mine for a year and a half and shows no sign of letting up, regardless of management? Traffic grinds to a crawl on the dusty highway through Casillas, a small city in the Guatemalan Department of Santa Rosa, roughly three hours southeast of the capital. Even on a busy work day, no vehicle may pass until the peaceful resistance stationed there has determined that it is not affiliated with or carrying supplies to the nearby Escobal silver mine, owned by Canada’s Tahoe Resources. It’s a makeshift blockade marked by canvas signs attached to tilted power poles, demanding justice for Indigenous people as they flap in the wind. The project threatens land, water and local agriculture, argue members of the resistance, who patrol the road in shifts. “We are willing to give our lives for Mother Earth and the children of the future,” Bernabe Rivas Ceballos told journalists, philanthropists and activists visiting the blockade on Oct. 26, 2017. Seven out of eight municipalities near the Escobal mine have formally opposed it in local polls, and since 2015, at least five of their mayors have refused royalty payments from Minera San Rafael — a subsidiary of Tahoe Resources charged with the mine’s operation. The project has been on hold since last summer over Indigenous consultation concerns, and just last month, hit a new snag as Guatemala’s Constitutional Court prolonged that suspension further with demands for new information and evidence. It’s a decision that sent more than 2,000 Indigenous Xinka people marching through the streets of Guatemala City last week, demanding permanent closure of the mine. The delays have been costly for Tahoe Resources, which suffered an $18 million loss in the fourth quarter of 2017, largely attributed to Escobal’s suspension. More than a quarter of Minera San Rafael’s 1,030 staff have already been laid off, and Tahoe has confirmed that more layoffs are on the way as the court examines whether the mine’s operating license is legal. The Escobal mine controversy is one of several surrounding a variety of Canadian resource companies that operate abroad. Over the last 10 years, they have prompted a wave of activist pressure that just this year, resulted in federal government action. In January, Canada’s International Trade Minister François-Philippe Champagne introduced some details of his plan to create of a new watchdog with a mandate to investigate allegations of abuse in the foreign activities of Canadian companies. Tahoe’s Escobal mine could be among those it is asked to review. On Monday April 9, thousands took to the streets in Guatemala City as part of the “March for Life,” organized by the Xinca Parliament and the Peaceful Resistance of Santa Rosa, Jalapa and Jutiapa. Representatives from the indigenous Maya Ch’orti’, Ixil, Quiche and Garifuna Peoples showed up in support of the Xinca People and their call for the permanent closure of Tahoe Resources’ Escobal silver mine located in Xinca territory. The Guatemalan courts temporarily suspended the mine over eight months ago as part of ongoing legal proceedings to determine if the Xinca People’s right to consultation was violated in granting the mining license in 2013. The courts will also determine if the Guatemalan Ministry of Energy and Mines discriminated against the Xinca People by justifying the lack of consultation by denying their very existence in the region. The case is currently being decided by the Constitutional Court that most recently ordered several Guatemalan academic institutions to carry out anthropological studies to determine the existence of indigenous people in San Rafael Las Flores, the municipality where the mine is located. (Santa Rosa/Jalapa/Jutiapa) From the Parliament of the Xinca People of Guatemala and the Peaceful Resistance of Santa Rosa, Jalapa and Jutiapa, in anticipation of the Constitutional Court’s conclusive resolution on the final appeal concerning proceedings over the “El Escobal” project operated by Minera San Rafael [Tahoe Resources’ wholly-owned Guatemalan subsidiary]. We reject the disrespect shown to us by [the court] in requesting reports to assess our existence in the municipality of San Rafael Las Flores, [an act that] negates our existence and identity. We are concerned by the Guatemalan Chamber of Industry and the Guatemalan-American Chamber of Commerce’s (AMCHAM for its acronym in Spanish) Public Relations campaign in different media outlets as a way to pressure the Constitutional court to find in favor of Minera San Rafael. Minera San Rafael is more concerned with its billion-dollar investment in the project than with the impacts they are causing throughout the region of Santa Rosa, Jutiapa, and Jalapa, including the destruction of our social fabric, as well as pollution, criminalization, forced migration and the violation of the rights to water and housing. We are concerned about how the community of La Cuchilla in San Rafael Las Flores has been destroyed and that, in order to protect the interests of Minera San Rafael, the state has not taken responsibility. Meanwhile, other communities are also at risk. To date, the idea of development touted in the media is not evident in our communities, as claimed by company executives. Since the resistance camps began in Casillas and in front of the Constitutional Court, there have been actions taken to provoke community members in order to create the conditions for their criminalization. Tremors have ceased since the resistance camp in Casillas began, despite state institutions responsible for such matters attributing the seismic activity to natural causes. Water for human consumption is becoming ever more scarce, making it necessary to drill underground wells, while the water table is also getting deeper. We reject all forms of interference on the Court by either foreign governments or the Guatemalan government. We understand the complexity of this case, for which reason we have waited, aware that the arguments being made as part of this process underscore the necessity that mining activities be stopped and a debate take place about this country’s development model. The Guatemalan Chamber of Industry to respect judicial independence, peoples’ right to autonomy and their right to live in peace. Constitutional Court justices to issue a decision that would permanently suspend Minera San Rafael’s “El Escobal” mining project, for the reasons mentioned. [The recognition] that this case is not the same as in the Oxec Case such that the Minera San Rafael case cannot be based on that verdict. And as long as our demands are not heard, we will continue in permanent resistance. Translated from the original statement in Spanish by NISGUA, Earthworks and MiningWatch. The national court is calling on several ministries and Guatemalan university researchers to produce studies in 15 working days. 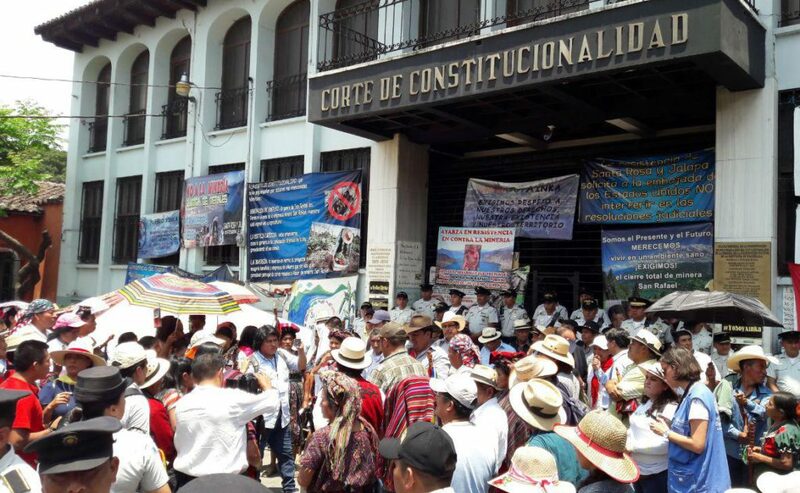 Guatemala’s Constitutional Court (CC) has ordered that a three-week anthropological study be conducted on the Indigenous Xinka people in the municipality of San Rafael Las Flores, before moving forward with a suspended mining operation. The national court is calling on several ministries and Guatemalan university researchers to produce – in 15 working days – various studies on how the two Tahoe Resources’ Escobal mines will affect the Xinka people who live near the border with El Salvador. Earthworks non-profit environmental organization says that local authorities have already conducted 18 municipal and village-level consultations processes in the affected areas where “tens of thousands” of Xinka and those in the Las Flores area have voted against any mining activity which the CC suspended last July. Two municipalities have even refused royalties from the mining company since operations began in 2013. Three others did the same in 2015. The Guatemalan Ministry of Energy and Mines (MEM) approved Tahoe’s mine on April 3, 2013, ignoring the 200 local residents, including Jimenez, who denounced the mine based on environmental and health concerns for the region. Jimenez appealed the MEM’s move and in July 2013 a Guatemalan appeals court ruled the ministry had not followed due process. The court ordered the MEM to address Jimenez’s complaints and hold an administrative hearing. The ministry filed an appeal in the Constitutional Court, which upheld the original decision. In June 2016, MEM began the hearing process before it was suspended shortly after. Two national universities “to submit an opinion” regarding an environmental assessment conducted by the MEM, the Ministry of Environment (MARN) and the Ministry of Public Health and Social Assistance (MPHSA). The MEM has been ordered to report within 48 hours about how it approved exploration and exploitation licenses for the Tahoe mining concessions and licenses. (Ottawa/Washington D.C.) On Wednesday, the Guatemalan Constitutional Court published a resolution and held a press conference calling for more evidence to be presented as part of the legal process that has temporarily suspended two of Tahoe Resources’ mine licences since July. Three Guatemalan government ministries and researchers at two Guatemalan universities have been given between 48 hours and 15 working days to present the information requested. This includes research centres at the San Carlos University and the Universidad del Valle, as well as the Ministry of Culture and Sport, that were ordered to each complete an anthropological study regarding the presence of Indigenous people in the municipality of San Rafael Las Flores. 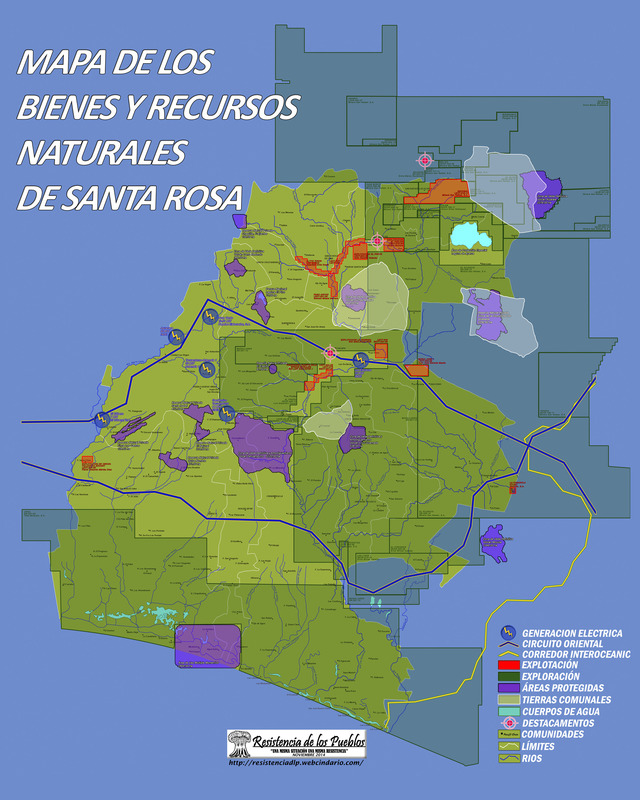 “We believe the Court already has sufficient information to make a decision, specifically a survey that the Catholic Diocese that serves the region of Santa Rosa undertook to better know and serve the needs of their congregation. This survey was done independent of this lawsuit and confirmed that six thousand Xinka people live in San Rafael Las Flores, not to mention the thousands of Xinka in nearby municipalities that are also affected by the mine,” Jiménez continued. To date, there have been eight municipal level consultation processes held in the affected area of the Escobal project, in the departments of Santa Rosa and Jalapa, in which tens of thousands of people, including Xinka, have voted against any mining activity there. Two municipalities have refused to receive any royalties from the mining company since operations began in 2013, with three others following suit since 2015. In addition to anthropological studies, the Constitutional Court ordered the Ministry of Energy and Mines and the Ministry of the Environment to immediately report on the approval processes for Tahoe Resources’ mine licenses and environmental permissions. Notably, the Ministry of Energy and Mines (MEM) approved the exploitation license for Tahoe’s Escobal mine on April 3, 2013, immediately after dismissing without consideration more than 200 individual complaints submitted by local residents based on environmental and health concerns, including one from Kelvin Jiménez. Jiménez appealed his complaint’s dismissal, and in July 2013, a Guatemalan Appeals Court found that the Ministry of Energy and Mines did not follow due process. The court ordered MEM to hold an administrative hearing to address the substance of Jiménez’s complaint. Lawyers for affected communities argued at the time that the appeals court decision put Tahoe’s licence in limbo. That same month, MEM appealed the decision to the Constitutional Court, which upheld the lower court decision and again ordered MEM to carry out an administrative hearing. In June 2016, MEM began the hearing process before suspending it indefinitely. To date, the complaint remains unresolved, as does the larger issue of community right to due process concerning these complaints under the terms of the 1997 Mining Law. Shareholders have recently raised concern about uncertainty over company permits and lack of social license in class action lawsuits filed against the company after its shares fell more than 30% in July when its mine licences were first suspended by the Guatemalan Supreme Court of Justice. Specific institutes at the San Carlos University and the Universidad del Valle, as well as the Ministry of Culture and Sport, to each complete an anthropological study regarding the presence of Indigenous people in the municipality of San Rafael Las Flores within 15 days. Specific institutes at these same two universities to submit an opinion to the court concerning Tahoe Resources’ Environmental Impact Assessments and studies carried out by the Ministry of Energy and Mines (MEM) and the Ministry of Environment (MARN) related to the Escobal project, all with regard to mitigation measures to avoid water contamination and related issues within 15 working days. The Ministry of Environment to present its monitoring reports related to preventing water contamination at the Escobal mine within 5 working days. The Ministry of Energy and Mines to report within 48 hours about how it approved exploration and exploitation licences for the Juan Bosco and Escobal concessions respectively. The Office of Sustainable Development within the Ministry of Energy and Mines to report all actions taken in relation to the Juan Bosco exploration and Escobal exploitation concessions. The Ministry of Environment to send the Environmental Evaluation Instrument it approved for the Juan Bosco licence and a copy of the resolution approving the Instrument. The following article was co-written by MiningWatch Canada, Network in Solidarity with the People of Guatemala (NISGUA), and Earthworks. It has been seven months since operations at Tahoe Resources’ Escobal mine have been suspended and, once again, residents are speaking out about what they perceive as a further attempt on the part of the company and its supporters to provoke conflict, delegitimize their right to peaceful and lawful protest, and undermine the independence of a judicial process over two of the company’s licenses. Below is a translation of a press release from the Xinka Parliament and the Peaceful Resistance of Santa Rosa, Jalapa and Jutiapa concerning an incident on Thursday February 15th in which representatives of Tahoe’s Guatemala subsidiary, Minera San Rafael (MSR), were stopped and questioned by local residents in El Tablón in the municipality of Casillas. The situation occurred after company representatives, accompanied by private security, reportedly refused to answer community member’s questions regarding the purpose of a meeting they had just held with a handful of coffee growers near Ayarza, a community located in the mountains near the Escobal mine. The statement denounces Tahoe for continuing work in the region, despite a judicial decision suspending operations since July. They consider this incident, and others leading up to it, to be acts of provocation from company representatives and supporters seeking to elicit a negative reaction from communities who already feel under threat as they defend their water, land and way of life in a context marked by tension, violence and criminalization since 2011. Miguel Colop Hernádez from the Office of the Human Rights Ombudsman (PDH) told Guatemalan media about how his office mediated the incident in El Tablón, stating that residents were “acting in defense of their rights” when they stopped the Tahoe representatives along the road insisting that they identify themselves and that they respect the suspension. In contrast, a sensationalist article published Friday in a UK newspaper that has been banned as a reference by Wikileaks describes the incident as a terrifying hostage-taking by a gang of armed men. The Guatemalan human rights official, on the other hand, made no mention of violence or threat of violence in his report, stating that the incident was resolved through dialogue and that the company representatives were freed immediately. To read full article and press release, click here. (Santa Rosa/Jalapa/Jutiapa) URGENT URGENT! We reject this clear attempt by Minera San Rafael [subsidiary of Tahoe Resources] to provoke communities, acting against the legal resolution [suspending mining operations], they continue to work and challenge communities. That situation motivated residents to ask the two people from Minera San Rafael [and Tahoe Resources] to sign an agreement that they promise to stop entering into their territories. There have been no attempts to harm them in any moment, as has been misreported to the public. We reject the biased declarations made by the Chamber of Industry and by José Valdizan of Emisoras Unidas, Prensa Libre and other media outlets which are attempts to blame and pressure the Constitutional Court. We call on the National Civil Police and the Ombudsman for Human Rights to enact the correct protocol to resolve this conflict and call for both parties’ human rights to be respected. URGENTE URGENTE! Rechazamos la clara provocación de Minera San Rafael a las Comunidades, pues aún contra una resolución judicial, siguen trabajando y retando a las Comunidades, situación que provocó que la población esta pida 2 personeros de Minera San Rafael firmen un acta de compromiso para no seguir entrando a sus territorios, en ningún momento se ha intentado agredirles, cómo se ha mal informado a la población. Rechazamos las declaraciones tendenciosas del representante de la Cámara de Industria y José Valdizan en Emisoras Unidas, Prensa Libre y otros medios de comunicación, pues tratan de culpar y presionar a la Corte de Constitucionalidad. Hacemos un llamado a la PDH y PNC para que se usen los protocolos adecuados para resolver este conflicto y que se respeten los DDHH de ambas partes. VANCOUVER (miningweekly.com) – Embattled Canadian miner Tahoe Resources has given itself until the end of the year to formalise a comprehensive new indigenous peoples policy as it deals with community protests in Guatemala, that have shuttered operations at its flagship Escobal silver mine for months. The policy is aimed at formalising and further enhancing the company’s approach to engaging with indigenous people across its operations, after its Guatemala operations became ensnarled in legal action by a nongovernmental organisation against the government, which has resulted in the temporary suspension of the mining licence, until formal engagements have been completed. According to the miner, the Guatemalan Constitutional Court on October 25, 2017, heard appeals of the Supreme Court’s decision to reinstate the Escobal mining licence. According to Guatemalan law, the Constitutional Court must rule within five calendar days of the public hearing. However, the Constitutional Court is yet to rule. In its latest news release, the company for the first time recognised the “presence and importance” of the Xinka nation, located near the Escobal mine. “In conjunction with formalising an indigenous peoples policy, we are working to take a more proactive approach to improving key relationships with indigenous peoples near our operations. It is in this spirit that Tahoe wishes to clarify and specifically acknowledge the presence and importance of the indigenous peoples located in the communities near Escobal, particularly the Xinka,” president and CEO Ron Clayton said in a statement. This commitment follows Tahoe’s announcement last week that it had signed the United Nations Global Compact (UNGC). As a participant in UNGC, Tahoe is undertaking a review of its policies and practices to ensure alignment with the UNGC’s ten principles on human rights, labour, environment and anticorruption. According to the company, the indigenous peoples policy will serve to enhance the company’s existing human rights policy that advocates respect for the rights of all peoples, including indigenous peoples. It will reflect Tahoe’s commitment to, and the UNGC’s emphasis on, human rights and responsible practices, and will endeavour to encompass the specific and collective rights of indigenous groups. “We are focused on finding a way to work constructively with the Xinka communities and other indigenous groups across the region. Tahoe respects the rights, customs and cultural heritage of all indigenous peoples, and we are committed to engagement and dialogue in all regions of our operations for the mutual benefit of everyone,” Clayton noted. Guatemalan lawyer under attack after representing Indigenous people opposed to controversial Canadian miner Tahoe Resources. Toronto, January 3, 2018 – Canadian lawyers and international organizations are pressuring the Canadian and Guatemalan governments to ensure the safety of Guatemalan lawyer Rafael Maldonado. The Canadian Bar Association wrote to Foreign Affairs Minister Chrystia Freeland expressing concern for Mr. Maldonado’s safety on December 20, 2017. Earlier in the fall, the Justice and Corporate Accountability Project, a group located at Osgoode Hall Law School wrote to the Canadian Embassy in Guatemala. Letters were also sent to the President of Guatemala by the Law Society of Upper Canada and the Law Society of England and Wales. Mr. Maldonado has actively defended community members concerned about the impacts of Canadian silver miner Tahoe Resources. He has received death threats, his office has been ransacked and shots were fired at his car earlier this year. The director and founder of the environmental organization where he works, the Guatemala Centre for Social and Environmental Legal Action (CALAS), survived an assassination attempt in 2008, and an employee was murdered in 2016. No one has been charged for any of these crimes. In June, 2017, Mr. Maldonado successfully argued that the silver mine should be suspended because the Guatemalan government had ignored the existence of Xinca Indigenous people in the area affected by Tahoe’s Escobal project. Within two days, Tahoe stocks plummeted 40%. Supporters of the Tahoe mine took out advertisements attacking Mr. Maldonado’s organization, CALAS. “Advertisements like this are very dangerous in a country like Guatemala, which has one of the worst records in the world for the murder of human rights defenders,” said Lisa Rankin who has supported communities around the mine for the last five years. International organizations such as Frontline Defenders, from Ireland and Amnesty International have also profiled Mr. Maldonado as a human rights defender in need of protection. “Canada needs to be seen to be protecting the right to carry out legal representation without being intimidated or murdered” said Shin Imai, a professor at Osgoode Hall Law School and counsel to the Justice and Corporate Accountability Project.